Here is a common repair that is frequent in every Harley Davidson service department. Starter ring gear replacement. 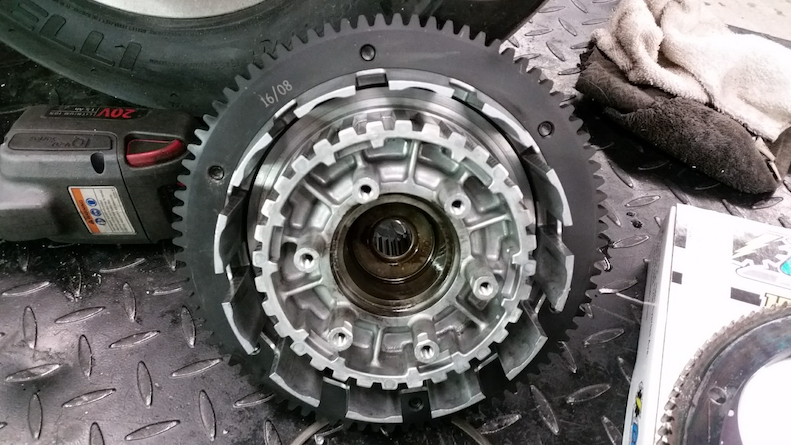 This is the large gear that is on the outer edge of the clutch basket. When the start button is depressed, the starter shaft shoots out and spins while engaging with this large ring gear. This action turns the primary drive which turns the crank shaft of the motor allowing the motor to cycle & start. Under normal operating conditions, a starter ring gear will last for many years or thousands of start ups. However, it is very common for riders to install cheap, weaker batteries or utilize a quality battery beyond its life time. When a weaker battery is used, it puts a lot of strain on the starting system of a Harley. This not only diminishes the life of the starter and the starter clutch, but it also allows for poor starter shaft to ring gear engagement. This poor engagement eventually wears away the surface area on the teeth of the gears. 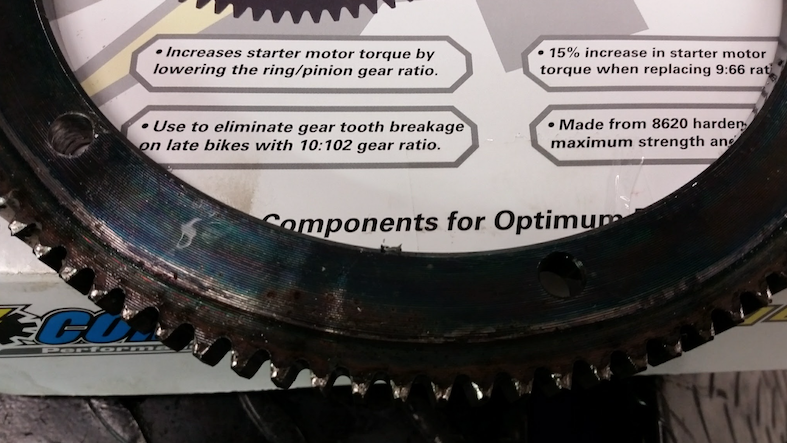 Teeth can even break off of the gears. Another reason a starter ring gear will fail prematurely is when a failing starter clutch is not addressed. If you hear a “zing-zing” type of sound at start up, you have a bad starter clutch. Again, this condition makes for a poor engagement with the starter ring gear. If you hear a grinding sound when trying to start your Harley, you will need to remove your outer primary cover and inspect your starter ring gear. There are a options when it comes to this repair. If the repair is to be addressed with OEM parts, a new clutch basket assembly will need to be purchased from HD. The ring gear is not sold separately. In fact, it is held onto the aluminum basket with large, bold, rivets. Another option is to purchase an aftermarket repair kit/assembly. Rivera Primo and Compufire sell excellent kits for this repair. 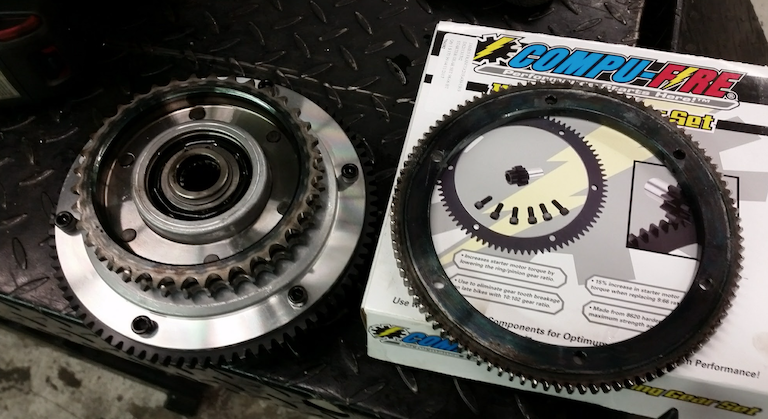 The kits include the small starter shaft gear and the large starter ring gear. The factory rivets are drilled and punched out. Then, the holes are drilled a little bit larger for the new retaining hardware. The new ring gear can then be bolted, securely onto the OEM Harley clutch basket. The kits typically have gears with less teeth (larger teeth allowing for more surface contact) for an even better, more definitive engagement over stock. My 2008 Electra starts easy when cold, but takes three or four times and sometimes a puff of smoke comes from the carb. Your issue may be in your tuning. Check for an intake leak. ring replacement on 2016 road guide standerd. 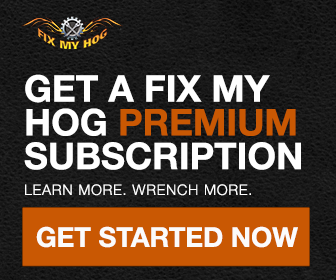 1/2″ drive, deep well sockets in order to remove your compensator & clutch hub assemblies.